Colchicaceae DC. Essai Propr. Méd. Pl. 56. 1804, nom. cons. 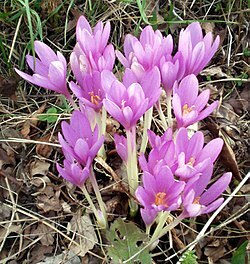 Type genus: Colchicum L. Sp. Pl. 1: 341. 1753. Bulbocodiaceae Salisb., Gen. Pl. : 52. Apr-Mai 1866. Burchardiaceae Takht., Bot. Zhurn. (Moscow & Leningrad) 81(2): 85. Mai-Jun 1996. Uvulariaceae A.Gray ex Kunth, Enum. Pl. 4: 199. 17-19 Jul 1843.
de Candolle, A.P. 1804. Essai Propr. Méd. Pl. : 56. Nordenstam, B. 1998. Colchicaceae. Pp. 175–185 in: Kubitzki, K. (ed. ): The Families and Genera of Vascular Plants. Volume 3: Flowering Plants. Monocotyledons. Lilianae (except Orchidaceae). Springer, Berlin/Heidelberg/New York, ISBN 3-540-64060-6. Emonocot.org 2013. Colchicaceae in The Orders and Families of Monocotyledons. Published on the internet. Accessed: 2013 Sept. 16. Tropicos.org 2013. Colchicaceae . Missouri Botanical Garden. Published on the internet. Accessed: 2013 Sept. 16.
International Plant Names Index. 2013. Colchicaceae. Published online. Accessed 16 Sept. 2013. Govaerts, R. et al. 2011. Colchicaceae in World Checklist of Selected Plant Families. The Board of Trustees of the Royal Botanic Gardens, Kew. Published on the internet. Accessed: 2011 11 23. Vinnersten, A. & Manning, J.C. 2007. A new classification of Colchicaceae. Taxon 56(1): 171–178. IngentaConnect JSTOR Reference page. For more multimedia, look at Colchicaceae on Wikimedia Commons. This page was last edited on 19 February 2019, at 09:10.